I have a new favorite pair of shoes! Fav color? Check! Suede? Check! Comfy? Check check! And non-slip soles! These beauties are compliments of Rhea Footwear, the perfect place to buy high quality, chic, and practical shoes! Rhea prides themselves on providing non-slip and slip-resistant footwear so that you can walk slippery surfaces with confidence. 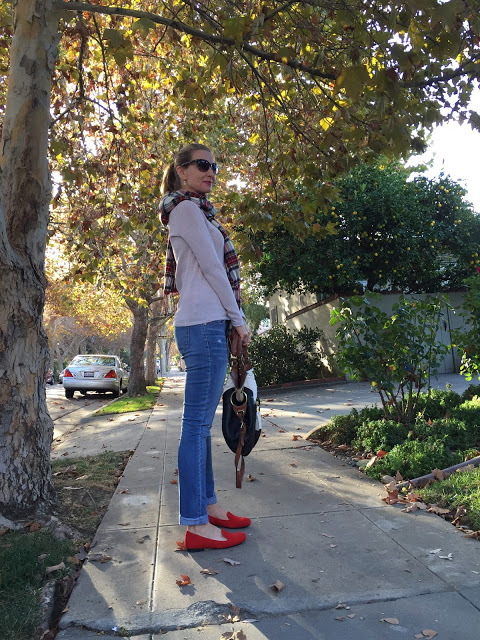 I’m head over heels for these Classic Flats in California Red! And be sure to check out their luxe Daphne Bootie (available in black and brown). So chic, yet so practical with a water resistant leather upper and of course their patented non-slip sole. Shop Rhea Footwear … it’s the perfect holiday gift … especially for yourself! PS: Do you have a big blanket scarf like this one to keep you cozy this fall and winter? I found 33 fab ones …. click here! Cute, comfortable flats are the best! These look great! Great outfit! Too cute! In love with those red shoes! Perfect with the scarf! Absolutely beautiful look, great combo as well, I love it especially your shoes and bag. Thank you for sharing, you look awesome!!! Adorable shoes in the perfect fall hue with denim. 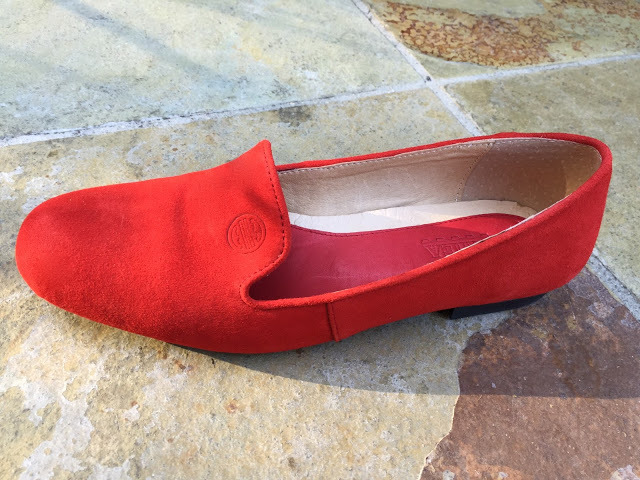 Love those bold red flats! This is such a great look! THose shoes are adorable! And you look fabulous as well!!! Gorgeous shoes! I love a great pair of red shoes! Love this cozy look and your pop of red! Oh my goodness these are ADORABLE!!!! Love how you styled them! I'm such a sucker for red shoes! Stopping by from the Pleated Poppy link-up! Looks so comfy yet stylish footwear! BTW – it's not too late to join this RAYBAN giveaway I am hosting for the SUNGLASSES SHOP of UK from Nov. 16-22! Love these red loafers on you! Thank you for being a part of TBT Fashion link up and hope to see you soon! These shoes are a beaut. I love the color and the way you styled them.